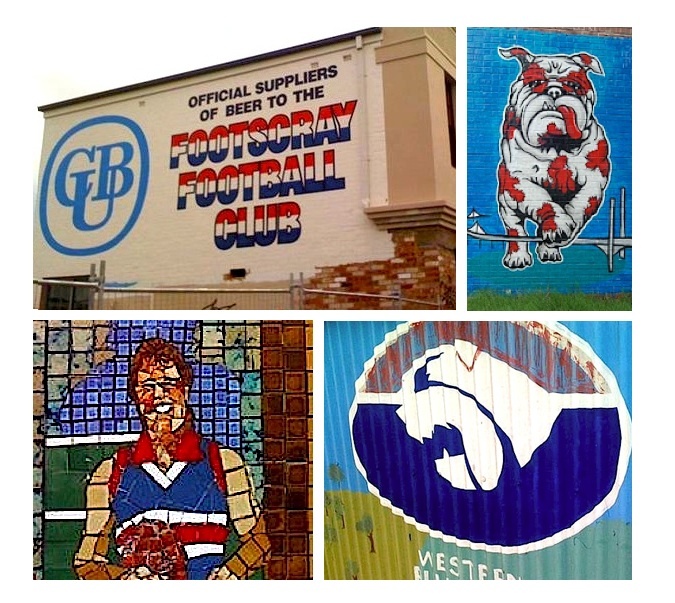 This entry was posted in Musings and tagged afl, Barkley St., Bulldogs, dogs, Doug Hawkins, EJ Whitten, footscray, Footy, graffiti, local, mosaic, red white & blue, suburb, VFL, Western Bulldogs, Western Oval by theholyboot. Bookmark the permalink. Terrific work, as ever. There’s a house in Hyde St worth checking out, near the Yarraville tennis courts. 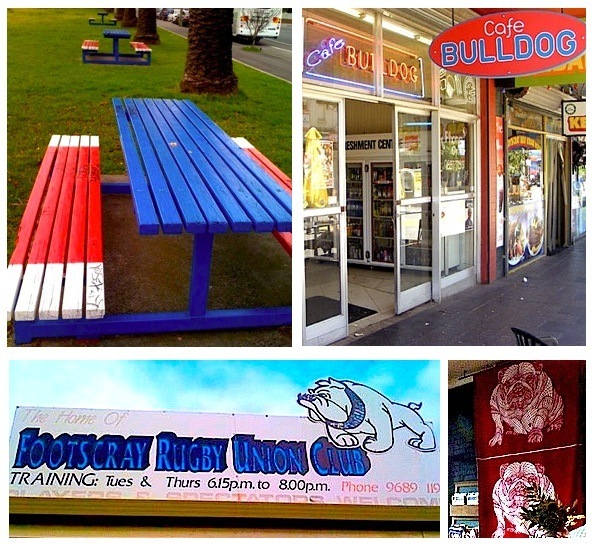 ‘Has a Bulldogs windmill and, when the Doggies are in the September action, much, much more. Alas, not this year. Great article yep their are some great photos out there here is a link to one I took around finals time! And Vin, you beat me to it. The house on Hyde gets a full make over come the Dogs finals tilt. The St.Monica’s wall mural is almost worth a blog post itself… showing the development of Scray from tents through to the city it is now, as you drive in from the Melbourne. 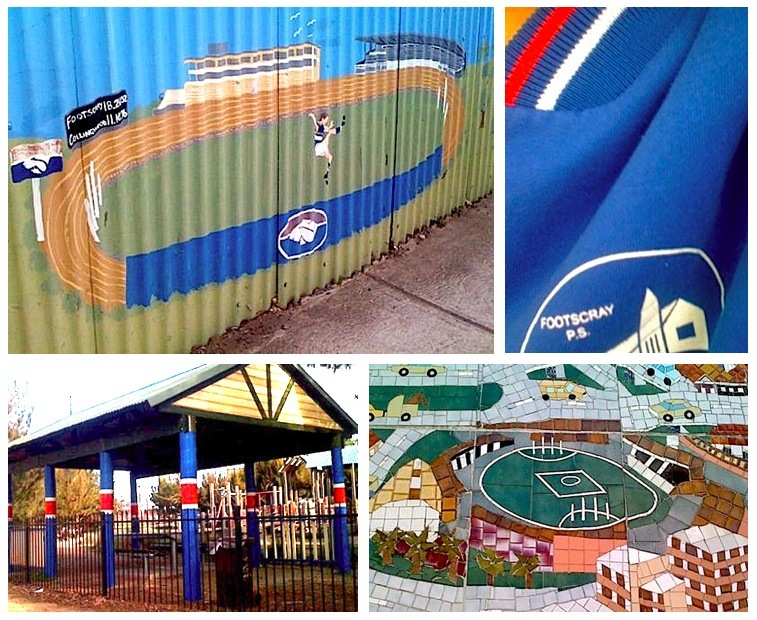 And they have also added a flag-based mural, possibly with all the flags of all the kids at school… not sure, but nice. 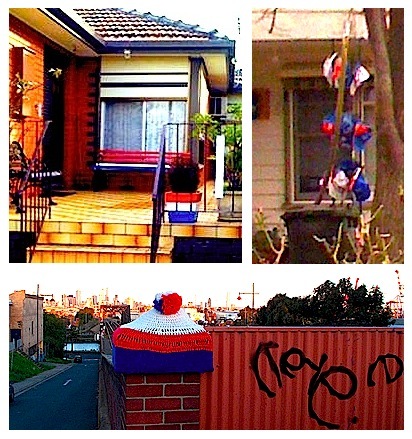 When I used to live in Yarraville, most houses in our street also turned RW&B, with streamers and flags. Can anyone offer another community with such an attachment to their AFL club? 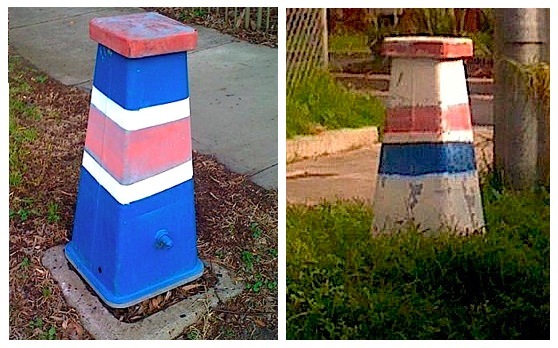 I dont think so… I mean, club colours on the picnic tables!!! PS… you do know when youre in Richmond though… lots of shops with Black and Yellow signs. 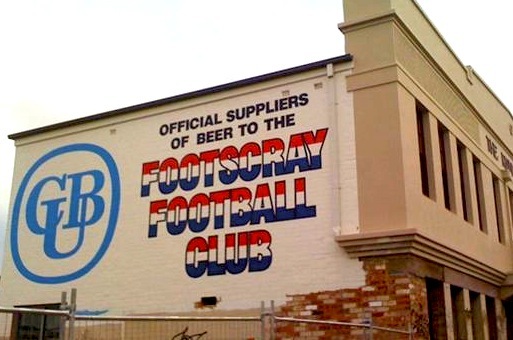 Its no doubt gone now but I remember a house in Footscray with a large sign in the window claiming “Nathan Brown is a traitor” after he moved to Richmond. I wonder if it was ever photographed? Thanks for your comments all, and thanks all for the heads up on the Hyde St house…check out the pic that Jonathan posted just above. Great stuff…fanatical to say the least! 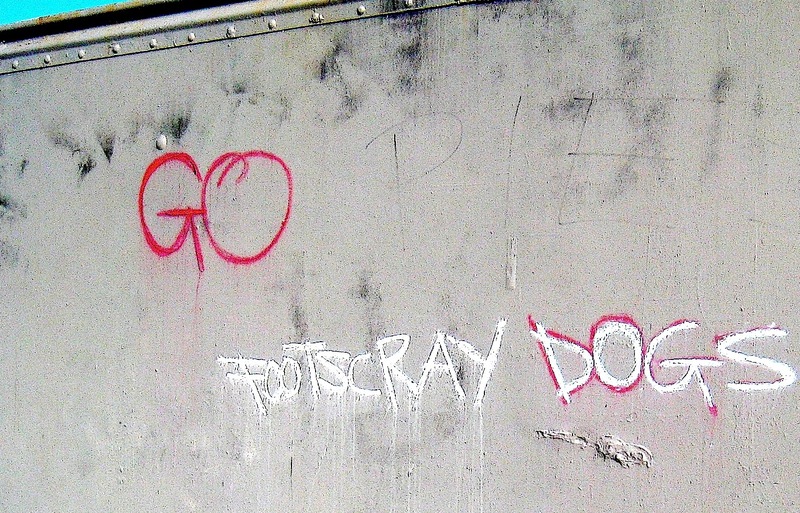 And footy maths….a look around Richmond is on the cards, you’re not wrong there. 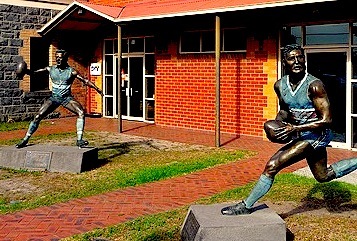 And how I wish Davo that I’d chanced upon the Nathan Brown is a traitor sign…found it hard to take to him when he came to Richmond because he was so blase about the $$…although the whole leg-break certainly changed my mindset. If anyone has any other pics I’d love to see them! It sort of reminds me of the last time I was in Belfast. Minus the tanks.